Simple things. What can I do that is simple and will increase my nutrition? I’m often asked that question, and the folks who ask it don’t know that it’s the question I ask myself all the time. When I read about soaking grains for the first time, I was pleased to find out that it’s really a fairly simple process. It takes some planning ahead, but if you’re already menu planning, adding the soaking step is a cinch. Your mission, if you choose to accept, is to soak your oatmeal for breakfast sometime this week. Why Would I Want Soaked Grains? “Soaking” whole grains can make them more digestible and help your system obtain all the nutrients in the food. Read a more in-depth explanation of the science behind the process here, and learn even more in my exploration of soaking whole grains here. This soaking process is recommended by Sally Fallon in Nourishing Traditions, but you won’t find it many other places. I’m not 100% convinced that it’s the only way to go, and neither is Laura. That being said, soaking your oatmeal is not difficult, doesn’t take any more time than not soaking it, can’t hurt you, and definitely changes your digestion. My mom is not the only one who notices a difference when her oatmeal is soaked. She has told me she’s certain she feels fuller when it’s soaked, and her digestion seems more ‘regular’ based on the end result. Go here if you want to read more anecdotal evidence that soaking grains makes them more digestible. Combine 1 cup rolled or steel cut oats with 1 cup water with 1 Tbs lemon juice or whey in it. I do it right in the pot. Megan reminded me that oats are low in the enzyme phytase, needed to neutralize the phytates. She found the information at Amanda Rose’s outdated free eCourse, now the Phytic Acid White Paper. The takeaway? Add a Tbs or two (10%) of wheat flour to your soaking oats, too. Leave at room temperature 24 hours (or at least 12). I usually think of it the night before, but the best for oatmeal is to let it go 24 hours. Tip: Just get oats soaking for tomorrow’s breakfast as you’re cleaning up today’s, as breakfast will be on your mind. Add another cup of water in the morning, bring to a boil and cook a few minutes until thick. Couldn’t be easier! Here is how to get whey easily when you just need a bit to use for soaking grains. Buy lemons on sale and freeze the juice in 1 Tbs portions in ice cube trays or popsicle molds. Store in a freezer bag. You could do this with whey, too, if you ever find yourself with excess after making yogurt cheese. 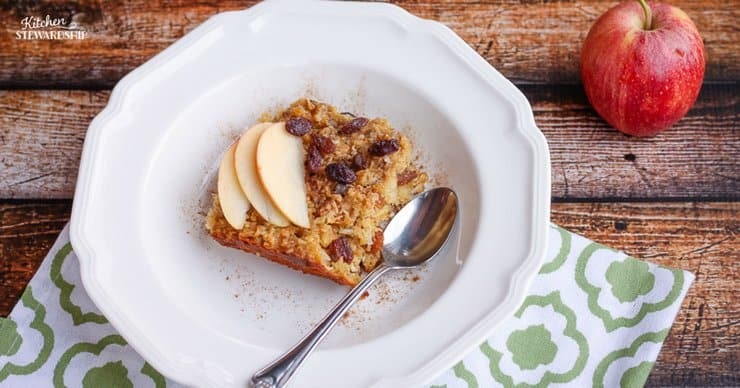 Another favorite way to have soaked oatmeal in our house, although it takes a bit more time, is Kelly’s Baked Oatmeal. Will you try soaking oatmeal? Do share if you notice a difference in digestion/satisfaction! « Previous Post Soaking Whole Grains: Why do It? The good news is that I soaked my oatmeal last night. The bad news is that I forgot the whey! I use steel-cut oats, and a side benefit is that they cook in 10-15 minutes instead of 30+. Really helps in the morning when I’m rushed. Although I was so far behind this morning anyway that I threw them in a thermos after cooking and ate them at work. Just wondering what your thoughts were! You’re right! I read that once at Cheeseslave and started adding whole wheat flour to my baked oatmeal, but I am too lazy to add that extra step for my regular oatmeal. Terrible, I know. I updated the post and credited you! Thanks!! So, I have all-natural, stone ground, GMO free, whole wheat flour in my pantry, but it’s not soaked or freshly ground. I don’t have whey or anything else mentioned here…would a Tbs of this stuff still do what you’re talking about? From the advice at another source I’m soaking my rolled oats for the first time right now, with lemon and warm water, and got online to find more info. Your post was at the top of Google! So I’m just now learning about the phytase issue, and started my first soak a few minutes ago (glad I found this). Since I’m here, I did have a couple other questions. -I want to keep my soak covered overnight, is airflow important? Could I use a clingwrap over the bowl, or should I just lay a tea-towel over? -What about storage? I’m making enough to last a week of breakfasts. Do I drain it and just stick it in the fridge when it’s done (how long can that last)? Can it be frozen? Should it be dehydrated somehow? Thank you so much for any help & info you can share! I started my first soak, of warm water, lemon juice, and rolled oats. 24 hours would have been late last night, and now it’s mid-day the next day…because things got crazy yesterday and I forgot about it. The bowl was left at room temp with a tea towel over them, and now they smell kinda bad, and when I tried to drain it off and got my hands wet, they also got really slimy. The oast don’t *look* bad and maybe this smell is the beneficial ‘fermented tang’, from leaving them out for a day and a half. Can you help me understand if they were out too long (I made a 4.5 cup batch). Or what I’m supposed to do with them now? Do I rinse, drain and store in the fridge? Do they need to be dried/dehydrated somehow? Or do I need to throw it out, because they smell sour and I took too long? Sorry I missed this for a day or two – for future soaks, your stone ground flour is going to be fine. It won’t have as much active phytase as freshly ground but I’d still use it (you should store it in the freezer though). Whey is super easy to get if you have plain yogurt around, and it’s so much better than lemon juice (not as sour). I just soak right in my pot and put a lid on it – airflow isn’t important here so do whatever is easiest. For bulk cooking, I’d cook it all up and store the leftover cooked oatmeal, then just heat that with a bit more water. For my family, I make a two-day batch and just leave the leftovers in the pot on the counter, then reheat the next day. For longer than a day (or in the heat of summer) you’d want to refrig. A week will be just fine for leftovers in the fridge! Hope that helps! My son has a wheat allergy. Is there a known substitute that works as well as soaking with wheat? Thank you again. I have Amanda’s e-course, but I’m still trying to sort through he-said/she-said between PhDs! I’m just wondering if there’s something besides wheat flour that would work instead. We are gluten intolerant at our home. Using rye flour is actually a better method. I do this all the time. Rye is higher in phytase (the enzyme that breaks down phytic acid) than wheat, a lot higher in fact. Using 2 tablespoons of rye flour you could even skip the whey if you wanted. Of course, if you really want to get all that phytic acid down you want to at least partially ferment. If you have a sour dough starter (usually of rye or a rye-wheat mix because of phytase) add 2 tablespoons of that to your soaking, no whey, lemon or other flour. You get the most bang for your buck soaking wise. The lactobacilli in sour dough starters not only let the grains sprout some but also break down the phytic acid actively, not just passively as in regular soaking (whey can do this somewhat, but far, far less effectively. You can use buckwheat groats! I soak my oats every night in my own almond milk adding 1 tablespoon of flax seeds and 1 tablespoon of chia seeds. However, I wanted to improve it having read the information about phytase. I try not to eat wheat at all but as I bake my own sour dough bread regularly I always have a starter. Last night I added 1 tbsp of my rye starter to my oat mixture. I ate it this morning but I need to admit that it was quite an unpleasant experience… I found it much too sour. I don’t add any sweetener to my oats and only add my own granola on top which has a bit of honey in it. I would like to continue as it’s so good for me but do you have any suggestions as how to make it more likeable? I added 1tbsp of starter to my 1/2 cup of oats, flax seeds and chia. Was it too much? Does it have to be wheat flour? I don’t like the pasty (sp?) feel when I add flour. I’m wondering if I could use cracked wheat or even bulgar instead. What do you think? I would think cracked wheat would work – as long as the whole grain has been broken open, the phytates should get active. You can use buckwheat too if you’re GF. I’d heard that any acidic substance would work (sour milk, butter milk, vinegar, lemon juice). I do soak when i remember, but it has not become a habit yet. Made some recently that i did soak, & before the sweetener it had a bit of bite from the vinegar. But after sweetening it wasn’t noticable. .-= Kathryn´s last blog ..Post Thanksgiving =-. You’re right, but in the experience of most people I’ve heard/known/read about, whey or lemon juice gives the least “sour” taste. Adding more sweetener to cover up the bite isn’t what I’m shooting for, so I go for the most “like oatmeal” taste. I totally notice a difference in how the oatmeal digests when I soak vs. no soaking. If we forget to soak it, I’m hungry in a few hours, but soaked I can easily last until lunch without any snacks. Also, it takes less time to cook when I soak it. Once you get the water boiling (5 min or so), it only takes another 5 minutes to cook. A little longer than cereal, maybe, but Dh and I usually cook it while we’re doing other things in the mornings. And the topping possibilities are endless!! Ok, you got me to do it! And I love it. I find it much easier to eat. I used to only be able to stomach so much oatmeal before I felt bloated. Now, I notice that I don’t get that reaction at all and enjoy my oatmeal more. My daughter has severe gluten reactions. We buy her gluten free oats because she’ll get sick just from the contamination with regular oats that have been run through a processing plant shared with wheat. So I don’t add the wheat. I found a great way to have whey on hand all the time is just to leave a “dip” of yogurt in the yogurt container. About a Tbsp or two of whey is there all the time now whenever I want it. How would you make up the wheat if you are gf? We are as well and would need to know how to do this. Thank you! Oh, the answer I was looking for is already here. Please ignore the other and feel free to delete it. .-= AmandaonMaui´s last blog ..Burgers…nom…Nom…NOM! =-. Is there anything besides buckwheat that will work? We are gf and buckwheat free too! Please share 🙂 What new info suggests that warm water does the trick? I love to read all the different perspectives, etc. What about for gluten free people? What do you mean by a “dip” of yogurt? Just wondering, can I use water kefir instead of vinegar for soaking? I don’t do dairy kefir, we drink raw milk and there’s no way my budget could stand kefiring raw milk…and then there’s just the I-just-can’t-drink-that-all-the-time factor too. I like it occasionally, but not every day! Too thick, rich and sour for our tastes here. I’m kind of thinking I can, but wondering if it’s possible. Thanks! .-= dawn´s last blog ..Soleil 100 Days =-. I would guess “yes”, but I’ve never seen research on that one. Maybe I’ll check my water kefir with a pH strip and see what it says! That’s all you really need, slight acidity. My preference is whey because I can’t taste the “sour” so much, and we make yogurt regularly anyway. Dairy kefir works great for ranch, cheese, smoothies, and as a sourdough starter or starter substitute. Amongst those uses I can get it in me and the family about 3x/week. My dog only gets it a couple times now that I learned the sourdough trick from Cultures for Health. I killed my water kefir grains when we moved and am trying the conversion from kefir grains. Back on topic though, I’m going to try buckwheat and lemon. Thanks for the info. Why do we replace the soaking water for grains like rice, quinoa etc, but not for oats/whole wheat flour? I used to think that the phytic acid or whatever’s bad seeps out of the grain into the water, so we throw the water away…? What about nutrients seeping out of the grain then? This is a very interesting question. First, one can’t soak flour and drain it, and actually, if you soak oatmeal and drain it you lose an awful lot of oatmeal, and, I’m guessing, nutrients too. It’s always recommended to rinse, say, legumes, for flatulence reasons, but I don’t think one would HAVE to rinse rice. I pour off the water so I can save some for next time for accelerated fermentation. Quinoa should be rinsed to get the hulls off. All that notwithstanding, soaking the grains to reduce the antinutrients isn’t a vastly researched subject. It’s possible that phytic acid released from your grains could bind back to the minerals you’d rather have in your body if not rinsed off…but it’s also possible that it won’t. I know, confusing. You’ll really want to read about phytates, phytic acid and soaking grains and phytase in soaking grains to learn more. I’m returning to (and finishing, for real!) the soaking grains subject this fall. Thanks for your reply! I really look forward to hearing more about your research into soaking, yup thanks so much for doing this! Well, not sure if this helps, but my Chinese mother always soaks brown rice in just plain water in the morning before cooking it at night, no rinsing or whatever. When I told her i discard the soaking water (after saving a bit for accelerated fermentation), she said i’m throwing away the nutrients.. but she much prefers cooking white rice. I used to think white rice was unhealthy, but lookign back into my traditional culture, maybe my ancestors knew what they were doing when they removed the hull and bran..
Not sure if this helps or not, but you rinse the rice because when soaking a large portion of the starch dissolves into the water, rinsing helps remove the starch. Hi…I’ve been pouring boiling water over the oats and super-rinsing what I thought was the “fattening starch ” out before adding gojis, chia and buckwheat kernals plus some tiny black sesame seed-sized seeds and fridging it till next morning. (You’re probably wincing & thinking “cro- magnon mother!”). Have i been breaking all the rules of nutrition and oat preparation? We are dairy free because of allergies. Can I add ACV instead of whey without making it taste bad? What do others with dairy allergies do? Also, does it have to be fresh lemon juice? My mom thinks that lemon juice is the least-sour tasting non-dairy option. She freezes fresh lemon juice in 1 Tbs portions in an ice cube tray, but I don’t imagine it has to be fresh. It just needs to be acidic, according to the Nourishing Traditions directions. I hope that helps! I’ve tried soaking my oatmeal for the 24 hours. I’ve done it twice and added the 1 Tbsp lemon juice (although not a fresh lemon). Nasty. I tried forcing my kids to eat it the first time without trying it myself. They complained so I tried it an it was awful. We ended up throwing it both times. All we tasted was awful lemon, and we do sweeten ours. What is wrong with us that it tasted so awful when everyone else seems to rave about this? I mix mine with yogurt and almond milk and a little honey and raisins. It’s totally ready to eat in the morning and absolutely delicious. I think I’ve figured out what at least part of the problem is. I brew kombucha in my (fairly small) kitchen – and the air seems to be heavy with the wild yeast spores from my SCOBY farm. I tried doing the soak with a tablespoon of flour and some kombucha mixed in with the water (I have a theory that kombucha is also an acidic and less sour than whey or lemon) and after 24 hours the whole concoction smells like sourdough starter. I strained it through a fine mesh nylon strainer and gave it a really good rinse with filtered water and when I add cinnamon and raisins it’s really quite delicious. I soaked my first oats yesterday! Finally made that baby step. Will be doing more in the future now that I have the first time under my belt. My oatmeal lunch was delicious & I think you’re right that it holds you over longer.. hum. I had a question regarding if I wanted to use yogurt, would it be the same amount as water? per your recipe above, 1 cup oats, 1 cut yogurt? Hmm… Can you taste the lemon? If I drained it, would that defeat the purpose of soaking? When you are soaking, do you keep a lid on the container or no? 2)Does this change the soaking process? I can’t say I’ve ever heard of “quick cook” and “steel cut” together. maybe they’re parboiled like quick cooking brown rice? If so, you probably wouldn’t be able to soak because they’re already cooked partway…then again, if you added fresh wheat to act as the phytase…maybe? As far as including milk, I would just soak oats in a 1:1 ratio with water overnight and then add another 1 part of milk in the a.m. for the cooking. Hopefully half and half will be okay! You can’t really drain the water b/c it really gets mostly soaked up. Is it really OK for the whey to be left out of the fridge for 12-24 hours? I just worry about food safety! Thanks! 1.Can I leave it out for 12 hours with homemade almond milk in it? 2. we have always made muesli in my family which is basically soaked oats in milk in the fridge overnight. I’m reading so much about different ways to soak, how does one measure if the soak is successful? I love the taste of our muesli and it digests well considering all the fruits (including lemon and orange) and nuts we throw in there. Does that mean I’ve found another way to soak? or does it have to be room temp. Thank you! I’m just wondering if soaking standard milled oats gives you the benefits (since it’s already been toasted) or if you need to start with raw oats? 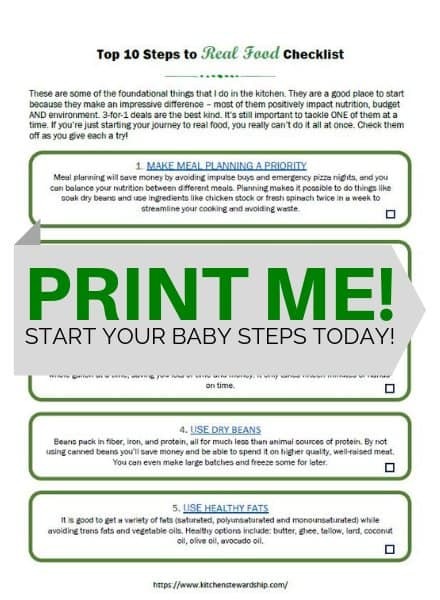 I LOVE that your posts are printable. You always have such great information I want to print some things out so I can really read it for comprehension! Thanks for such great content! I have been soaking my oats for a while now. I use whey and warm water, but I always struggle with the idea of adding wheat flour. It just doesn’t make since to me when I think about it from a historical perspective. Would traditional cultures that ate oats have access to wheat flour and the knowledge to do add it? Also, it just doesn’t seem like God would have created oats to be dependent on a completely different grain in order to be nutritious. Maybe I’m just looking for justification because my family doesn’t like the oatmeal as well when I have added the wheat. I would love to know your thoughts on this. I never noticed a difference in taste with the flour – it only needs to be a little, 10%, but maybe I’m just not very observant. I feel like I’ve heard of traditional oatmeal as super long fermented (heard of porridge in the pot 9 days old?). Maybe that’s how the earlier folks got it to be better for them. Or maybe they added a bit of sourdough. I think if a culture had the knowledge to grow oats, they would have had wheat too, but I’m just guessing here. I plan to make granola. Would I presoak the regular oatmeal? What proportion of water to oats? Does it brown eventually? I want to add nuts before baking and fruit afterward. Is that doable? I’m so sorry I’m so belated on your comment! Somehow yours got buried in others from last week and I just didn’t see it right away. I have the soaked granola bar recipe, but how do you dry the oats after soaking? It just says 4 1/2c soaked & dried oats. Also, does the 3 c oats & 1 c water that you soaked come out in the end to the 4 1/2c in the recipe? Thanks for your help & great ideas! So you have to do that step before even starting the granola bars. And no, 3 c. oats will only end up around 3 c. after soaking and dehydrating. Hope that helps! We tried lemon juice and whey, but we can still always taste the sourness, probably because we don’t add sugar or honey to the oatmeal, just raisins and seeds. I have given up on soaking, it just doesn’t seem to be that important to me. Yes, the phytates will steal some of the minerals from me, but what with all the other things that I eat that are not perfectly healthy? Well, I am a beginner at NT cooking and I find it helpful to concentrate on one thing at a time. Eating good-quality animal products just seems a lot more important than soaking grains to me, especially if it gets complicated. 1. New research is showing that soaking in just warm water (no acidic medium at all) may be just as effective. 2. Adding virgin coconut oil and cinnamon to oatmeal helps me get the “sweet” flavor w/o the sweets. 3. Cheese whey is quite a bit yuckier than yogurt whey, since I don’t know which you used. these are very good and interesting suggestions! We used kefir whey, probably on the sour side. Just another reason to start making yoghurt! Is it true that soaking in warm water might be enough? I only read the lengthy article by Ramien Nagel on Phytates and it seemed that oats were very hard considering removing phytates. Thanks again! I have been following your blog for about 6 months, and I love the info. You are telling me things I have never heard before. Soaking grains is new and interesting to me. Since we eat so much oat meal i’m going to ask, quick oats are out for soaking? Hi, I just came across your website and have been reading through the comments of this article. There was a question(s) about the difference between rolled oats & steel cut oats. And I remembered long ago watching a show called Good Eats on the food channel. Alton Brown is not your typical chef, but he goes into the science of food and I love learning sooo much about the food & how it reacts when making recipes. He did a show on oats and gives a whole lot of info. Here’s the link to part 1 on youtube: http://www.youtube.com/watch?v=eH8tEw938RM . I need to warn you though that he is a bit eccentric and there is an odd part that doesn’t seem to do anything with the episode about the Scottish making some type of food – I just skipped that part. But here’s a link to the second part of that episode about oats: http://www.youtube.com/watch?v=-j-Hkihja-0&feature=related . In the second part he gives good visual about the two types of fiber and how they work in our body. They are very informative & interesting. I love his shows. The sour taste depends a LOT on how much lemon juice you use (whey is MUCH much less sour in general), how warm the temps are and how long it soaks. I’ve never eaten it actually raw, but I’m pretty sure the WAPF folks would say that’s a no no. If you don’t like warm oatmeal, could you try soaked granola? It’s delicious! Similar idea, soak (in less water) and then toast in the oven or dehydrator. It stores great and is such a quick breakfast. Good luck! 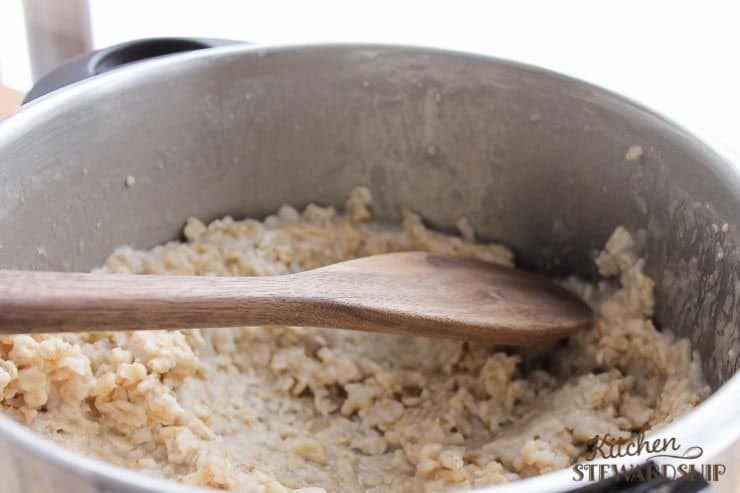 Do you strain and rinse the soaked oats before cooking? No, you don’t drain the water at all. Just use half the needed water for the soak and add the other half in the a.m. Thank you for answering my question. I’ve been doing a lot of research on this topic and would love to know why you don’t think it’s necessary to strain and rinse and start with fresh water. Based on everything I’ve read, I’ve come to the conclusion that it’s best to strain and rinse, but if you have a good reason why that’s not necessary, I’d love to know! It’s a great question, but tricky. I found the non-dairy acidic option unpalatable. Unfortunately, I have absolutely no access to raw milk or cream products so ‘real’ whey, yogurt, kefir and buttermilk are not options. Just how bad do you think a store-bought buttermilk or yogurt product would be when used in such a small amount? I buy store yogurt sometimes, and my homemade yogurt is most often made from store milk, so yes! you bet – use store cultured dairy. Or even make your own yogurt so you can culture it longer, if that’s important to you (gets rid of most of the lactose at 24 hours incubation). I stumbled across this post and have a question about quantity. If I am making oatmeal for 6-8 people would I add more whey/lemon juice to the water and oats? I don’t want to make them too sour and so i hesitate adding more than what is indicated. 1 Tablespoon of acid medium is usually recommended for every 1 cup of of oats/1 cup water. So, if making 6 cups of oats, you’d probably want 6 Tablespoons of the whey or lemon. We like to make oatmeal with milk, not water. Can I soak it in milk? To see benefits from soaking, you need to use an acid medium. Yogurt, buttermilk, kefir, or whey if you want to use dairy. Non dairy options would be yogurt, buttermilk, kefir, and whey. Plain milk could be added after the 12-24 hour soaking period, though, if you enjoy that with your final product. 1 cup of oatmeal?? That’s an awfully big portion for 1 person. My packet recommends 1/3 cup and I actually use 1/4 cup as I also add some banana after cooking. In the book Wild Fermentation, the author suggests soaking oatmeal in a jar 24 hours with plain water. That is what I do, though I use steel cut oats and it rarely gets the FULL 24 hour soak. I make my steel cut oats in a jimmy-rigged double boiler in my crock pot overnight so dh can grab some on his way out the door at 6 am. We are dairy-free and never liked the sourness using ACV or lemon juice, even when I soaked only 12 hours and used less of them. So reading that even a water soak helps was SO FREEING! Dh finds he doesn’t get hungry for a morning snack when he eats these crock-pot oats and the kids eat them way better than nomnm-soaked or rolled oats. Thanks for your thorough post! Please clear something up for me re: soaking oats (or any other grain). I read that the water that you soak oats in should be discarded before cooking, to remove the phytates/phytites, otherwise you are consuming them with the oatmeal. Is this true? Can someone shed some light on this. Thanks so much. I tried this last night. The oatmeal was soooo unbelievably sour I couldn’t eat it. I used whey and added cinnamon and honey, but no go. What did I do wrong? the whey was fresh -I had just made some yogurt the day before. help…..
* amount of whey – only 1 Tbs. per cup water, then adding double the water in the morning – so for 3 cups oats, for example, there’s only 3 Tbs whey and 6 c. water in the end. * time – how long did it soak? More than 12-24 hours starts to get sour, too. I hop if you try it again, that the experience is better! I’m probably too late for this piece of advice, but you can use the soured oatmeal in baking bread – add a cup to your next batch of dough in place of flour and reduce the liquid a bit. Fluffy bread! Can you use lime juice instead of lemon when soaking oatmeal? 1) Take out of fridge and let set for an hour or two (so it isn’t so cold). 2) Eat raw (soaking makes it soft as if it were cooked). 1) By soaking in the fridge, do I lose the benefit of phytic acid break down? 2) If the answer to #1 is yes, can I soak the oats overnight on the counter without risking food poisoning? 3) If the answer to #2 is no, can I add a tablespoon of whole wheat sourdough starter to the mix to prevent bad bacteria from growing? I really want to find a way of doing this with only milk (no water). Any suggestions are welcome. 1. Fridge doesn’t cut it. 2. In yogurt or raw milk, you’re all good on the counter. hi! been lurking around your blog for sometime, many of my bookmarks are from here! 1 qn here, is it okay that i have the soaked oatmeal with milk uncooked? cause thats how i usually eat it, throw oatmeal and milk into a container and it becomes lunch at school! so was wondering if the soaked version can be done that way too. thanks in advance,love your blog!!! okay i just saw your above reply that it needs to be cooked to finish the job. i think i’ll cook half the batch and mix it with the raw batch as i like the texture of raw soaked oats. at least i’ll get half the benefits!! Does anyone know if soaking grains causes the glycemic index to change? I googled it but didn’t find any info. Thanks! Do you let it sit out uncovered all that time, cover loosely or with a towel, or cover more tightly like with the pot’s lid? Typically tightly covered is just fine.